The last day of May, so time for the next canvas print. 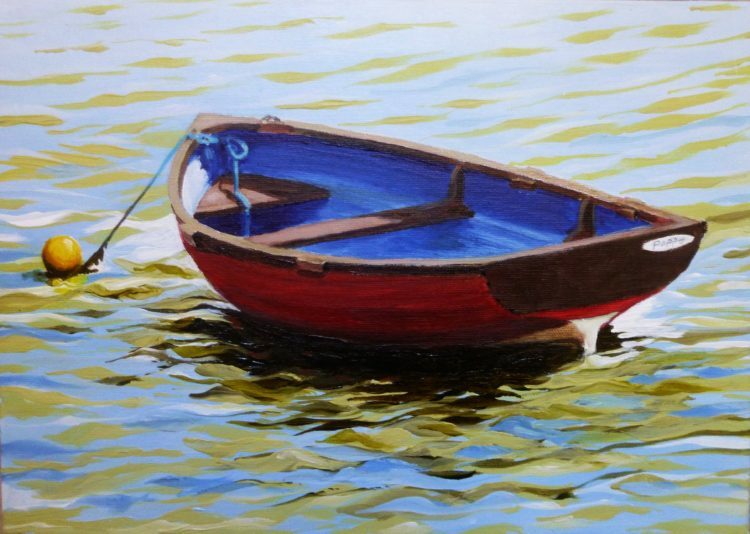 This one is from another painting of the little red dinghy, Poppy, at Heybridge Basin on the River Blackwater. As usual all the details are on the Canvas Prints page of this website. Just a reminder, that the price of my canvas prints will be going up after 10th June, so if you’d like one at the old price now is the time to act! It really doesn’t feel like the end of May – we had a tremendous storm in the night, with thunder and heavy rain and strong winds. My first job after I came home from my violin lesson this morning was to tie my white climbing rose, Madame Alfred Carriere, back up to her trellis – the wind had whipped the stems around to such an extent that the wires had broken and the whole thing was thrashing about. I’m really hoping that June is going to get a bit warmer and calmer!